When a woman gets married, she not only becomes a wife. She also becomes the woman of her house. Her dishes fill the cabinets. Her curtains dress the windows. She decides where the loveseat sits, how the towels are folded, and what knickknacks line the shelves of the china cabinet. Though some may brush off these little things as trivial (and my domestic depiction of women as horribly unprogressive), I think there’s some truth in idea of “the woman of the house.” Sure, the man may wear the pants, but it’s often the woman who decides, the woman who is the heart of the household. I think that’s why bridal showers are so important. Those gifts you get as your married life begins help define the spaces you’ll create and live in together. As a kid, I remember how sacred my mother’s wedding china and silver were. We set the table special with it for birthdays and holidays, and we never soaked the knives or put the gold-rimmed plates in the dishwasher. Technically, they were my dad’s special things too, but I have always (and will always) associate them with my mother. Her bridal and wedding presents are there in my childhood memories. My own bridal shower was nine years ago, but it took a long time for me to make the gifts I received part of my own family’s life, mostly because I became the woman in another woman’s house. My mother-in-law, a remarkable woman who loved children and music, died on an October morning in the house she’d lived in for twenty-five years. When my husband and I heard the diagnosis she’d been dealt – Stage IV pancreatic cancer – we decided to come back home. We bought the house from his parents, and because his parents, brother, and sister all still lived in the house, we moved into the finished attic. They were the Downstairs Davies. We were the Upstairs Davies. For ten months, our upstairs/downstairs lives ran mostly parallel, only sometimes intersecting. Up in the attic, John and I clapped as our one-year-old took his first steps; we watched our newborn drift off to sleep in his bassinet; we celebrated John’s new teaching job and my acceptance into grad school. Downstairs, my in-laws decided on drug trials, weathered through chemo and radiation, and saw their youngest graduate from high school. We all tried to honor each other’s dibs on the food in the fridge. I think – no, I know – it was a lot easier for John to shift back to life in his childhood house. The only time he hadn’t lived in those rooms was the first year of our marriage, when we lived in New Hampshire. Figuring out how – and if – I belonged, though, was tough. I didn’t want my presence to feel like the grim reaper, like I was taking over for my mother-in-law because she was dying. Our names were on the title of the house, but it wasn’t really our house. It was hers. I didn’t want it to be my house either. I wanted her cancer to be cured so we could sell the house back to them, and then John and I could buy a little house for our little family and live our own little life. But that wasn’t going to happen. John and I would wait for Tuesdays to clean, because every Tuesday my father-in-law drove my mother-in-law three hours west to Buffalo for a chemo infusion. It didn’t feel right to clean in front of my mother-in-law: it seemed too judgmental or pushy. We vacuumed the stairs and scrubbed the toilets, and when she came home those nights, exhausted, I think she was happy to see the shiny kitchen floors. When you live with someone with a terminal illness, you try to strike the balance between helping as much as you can and not making that person feel obsolete. We kept trying. For the last few weeks, my mother-in-law rarely left her bed. The house was neither hers nor mine: it was handed over to the siege of family who came, visited, prayed, mourned, and stayed through that Indian summer of a fall. Quiet permeated the house. The endless lasagnas – the official food of the bereaved – were turning old in the fridge, no one left to eat them. John’s dad told us we should move downstairs. It was getting cold, and the space heaters up in the attic weren’t really adequate for central New York winters. Plus, our three-month-old was getting too big for the bassinet, and we needed more space to move our toddler into a big-boy bed. After my mother-in-law died, my father-in-law, in his grief, stopped sleeping in their bedroom. Instead, he pulled a futon down to the dining room and slept under the table. John and I didn’t want to move into his parents’ bedroom. It would be too strange, we decided, for his siblings to come home and see that we occupied that room, that I had literally taken her place. So, instead, we made that bedroom the boys’ room. We went to Home Depot to pick out paint colors, to put a coat of new life on the walls. I started cooking in my mother-in-law’s well-worn pots and pans, rooting through her mountain of spice jars. My own pots and pans, dishes and silverware, and special casserole dishes and crystal bowls – all my bridal shower and wedding presents – stayed taped up in carefully-labeled cardboard boxes in the basement. How could I possibly start replacing her things with mine? The thought of it was tantamount to kicking my husband and all my in-laws in the gut. Even though I was preoccupied by what my in-laws would think of any small woman-of-the-house action I took, I knew deep down that I couldn’t start taking over because the house was still so full of her. His paralysis frustrated me. Terminal disease is ugly, but even in the midst of its horror, I found myself thinking it would end with a miracle. Now that cancer had won, though, I wanted the story to end as finitely as lowering a casket in the ground. Our life was still moving, and I needed this house that I had lived in for almost a year to become our home. John finally got fed up with his dad’s inaction. Everyone was coming home for Christmas, so we wanted to get our downstairs move settled so we could set up beds and futons for the rest of the family. One afternoon, when his dad was out on one of his six-mile walks through the neighborhood and circling up to the cemetery, John folded his mother’s clothes, placed them neatly in boxes, and moved the boxes down to the basement. Not thrown away, just moved, he justified to his dad. The boys needed a room, not a tomb. My father-in-law loves boats, so we made the boys’ room a blue-and-white boat room. John framed pictures of boats cut out of an old calendar, and my mother and I stenciled happy sailboats on the walls. We set up the boys’ crib and bed and put up a bookcase filled with both ours and my mother-in-law’s children’s books. The morning sun was always beautiful in that room. And then it was December. I filled almost two grocery carts the day before everyone arrived for Christmas. You could count on my mother-in-law to stock the pantry with everyone’s favorite foods; she always had an unopened box of Quaker Squares waiting for me when we came for a visit. I tried to do the same for Christmas that year, thinking that even though their mother was gone, my brother-in-law and sister-in-laws’ sadness would be partially assuaged if the right snacks were in the fridge and cabinets. I didn’t want to trigger a grief-induced fit because there weren’t any boxes of Italian bread pizza in the freezer. Decorating the Christmas tree was a big deal for John’s family. I remember, in previous years, helping out on tree-decorating night. All the ornaments were spread out on the dining room table, and everyone helped to fill every branch and crevice on the tree. There were really too many ornaments for the tree, but every mismatched one had to be hung up. The ornaments had souls, my father-in-law liked to say. You’d crush that little soul if you left it off the tree. This Christmas, I pulled the boxes of Christmas ornaments out of the basement and laid them out on the dining room table. John untangled the lights and set up speakers to play Christmas music. I kept my own ornaments – my ballerinas and rocking horses from childhood, our “first Christmas” ornament we purchased on our honeymoon, the matching bride-and-groom snowmen I got at my bridal shower, our son’s first Christmas glass ball – locked up in our trunk of Christmas decorations. I set out my mother-in-law’s nativity set and nutcrackers, not my own. Part of the reason I didn’t take out our ornaments was because I thought they might be seen as alien invaders on the dining room table, as one more change since my mother-in-law died. The other part of my decision, though, was because I didn’t want my things all jumbled up with theirs. This Christmas – the food, the traditions, the decorations – was not really mine; it was theirs. I wanted to stay out of the way. In the kitchen, doing laundry, and shoveling snow off the steps, not in the spotlight. I didn’t feel bitter. Actually, staying off stage was more my thing. I was a theater junkie in college, and I spent all my free time building and painting sets, adjusting lights, and running dress rehearsals and performances from the wings and the control booth. I liked setting the props and making the show run smoothly. That often-invisible work gave me joy. That Christmas morning, though, I did mess up one thing. In my family, my mother made her grandmother’s cinnamon rolls every Christmas and Easter. Grandma Lou’s cinnamon rolls are a labor of love: the yeast dough is made from scratch, and the whole process – from rising to sprinkling on the sugar and cinnamon to slicing and baking – takes about three hours. Grandma Lou’s cinnamon rolls are Christmas to me. Since John’s family always had cinnamon rolls on Christmas morning, too, I figured I’d wake up early and make my cinnamon rolls for everyone. My primary mistake was not fully appreciating how important goopy white Pillsbury frosting was to the Davies Christmas morning cinnamon roll experience. I put the casserole dishes full of hot-out-the-oven Grandma Lou cinnamon rolls on the dining room table (I had even made a double batch), and then, one of my sister-in-laws walked into the room. “Where’s the frosting?” she asked. I had no response except to go upstairs, shut the door, and cry. Traditions, I’ve since decided, aren’t exercises for the present. We make them so that in the future, we can try to recreate our past. In the months and years after that first Christmas, I slowly started opening my boxes in the basement. When you leave things in boxes for a long time, as anyone who has moved understands, you forget what’s in them. So, for me, it was like having a mini bridal shower each time I peeled away the packing tape on a box. I moved my plates into the cupboards; emptied a shelf in the china cabinet to put my wedding champagne flutes; propped up our wedding portrait on the mantle. I packed up everything of my mother-in-law’s that I had replaced, neatly labeling the boxes. But the transition was slow, and I was always acutely aware of what my in-laws said or how they reacted when they visited and saw some of the changes. I knew they needed the house to still be, in some way, their mother’s house. John and I lived in his parents’ house for six years, and our four kids quickly filled the place with legos, train tracks, and non-washable crayons. I always felt, though, that our life there just existed on the top, the surface of it all, never permeating through and through. And I was envious of my friends and sisters and sisters-in-laws when I visited their houses, because those houses were theirs and theirs only. 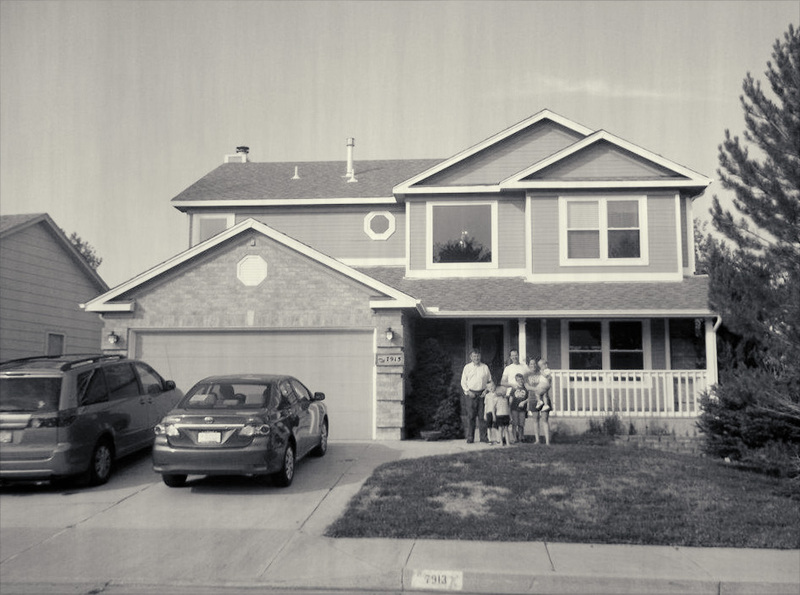 Seven months ago, we moved halfway across the country, and when I stepped into our new house for the first time, I was astounded by its emptiness. It was a blank canvas. It could be our house. This Christmas, I spread all our Christmas ornaments on the dining room table, and we hung up every single one on our ten-foot-tall tree. Ornaments have souls, you know. Christmas morning, we watched the kids open presents, our Christmas plates piled high with Grandma Lou’s cinnamon rolls and breakfast casserole (our new Christmas tradition, which will probably cause no end of heartache for our children in the future.) The morning was perfect and seemed so far removed from the sickness and sadness and loss that had shaped our first few years. Not that our life was perfect – we’ve had our own sickness and sadness and loss to overcome, but it’s easier to cross through all that when you’re in charge, not a spectator. John and I finally had our own little house and our own little family, and I think – no, I know – my mother-in-law would be so happy for us. Our first ‘new’ home in Colorado. My father-in-law still lives with us and we now have four children. 8 responses on "The Woman of the House: The Death of an In-law"
You are a beautiful person! What a sensitive way to help your grieiving family adjust. I love how you wrote in an honest way, and that you even admit your flaws. Your family is blessed. I hope you have your grace when I need it. Thank you for this essay, and the happiness you bring. About to make the same move as my mother in law passed hours ago….American in Italy . Furniture that is 200 years old will be waiting. Strangely, I cried so much when my husband said we were going to move there. I said, I don’t want anything to change. Difference is, I want my kids 4, and 3 not to suffer. But I’ll be in the same situation as you. Thanks for what you’ve written. My mother-in-law is dying in a skilled nursing facility fifteen hundred miles away. Her daughter has lived near her mom and has cared for her since the death of her husband. My husband and I visit from the north at least once a year and lately more often to be supportive of his sister. It is really bothering me that Mom is alone for all but occasional five- or ten-minute visits from her daughter. I am not faulting my sister-in-law. She has taken very good care of her mother’s physical needs, lost her own husband six months ago, teaches full time and is managing finances and upkeep on her mother’s and her own house. My problem is that no one cares to spend time with the person who is dying. I want to go down and just be present for Mom, but my husband doesn’t want me to go mainly because he would feel guilted into going with me. The idea of my mother-in-law going through this journey and dying alone is driving me crazy. Out of respect, I must go against a strongly held belief that the dying person is the most important thing…not her clothes or her quickly emptied house, which her daughter has had time to arrange. I am simply horrified at the priorities and lack of empathy that both my husband and his sister are displaying. I would love to sit with Mom and hold her hand, read to her and just share her passing hours, but no matter what I say or do, I don’t feel comfortable going or staying home while she does. Ugh! We lost my mother in law yesterday. Looking online for comfort and insight for my unknown role, your family story, though different than ours, gives me comfort this morning. Beautiful words. Thank you, Laura. My mother-in-law just passed away unexpectedly from a brain aneurysm in December, right before Christmas. She was an amazing woman whom everyone loved dearly, including myself. I had the pleasure of knowing and loving her for 20 years as my second mom. Within a week of her passing my husband, my two teenage children and myself moved into my husband’s childhood home to live with Dad. It was a way to help him out since he was extremely dependent on Mom and I couldn’t bear the thought of trying to keep two houses (we lived right next door), and as a way to help us out financially. It has been good in many ways, but I am also grieving the loss of my old life and home in addition to grieving the loss of Mom. I totally get the feeling of “not really my home” and know that it will take a lot of time for us to feel settled. We are all trying to find our “new normal” and some days are easier than others. But on the positive side I think it has brought us all closer as a family. We haven’t had a family Holiday yet other than Christmas – which for us was too soon after her passing to really count it – we kind of felt like Christmas didn’t really exist for us this year. Decorations were already up so we really just went through the motions on a smaller scale…I think this will be a year of some tough firsts to be sure. Thank you for sharing your story. It helped me feel like someone else understands what I am going through. Many blessings to you and your family. I am so sorry for your loss and wish that your father-in-law is still in good health until now. It is really hard to celebrate after losing someone you love but people have to move on with their lives. I agree that ornaments have “souls”. You remember the person you miss as you decorate your home with it.